Walking into Sherwood play plot, two huge erected white tents welcome you. 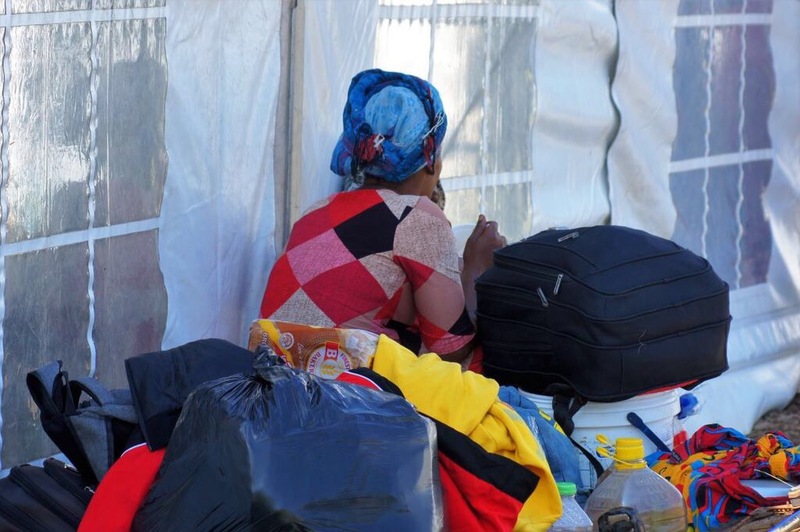 Despair, uncertainty, and confusion is written all over the faces of the displaced Malawian nationals who were kept at the place of safety, following violence that broke out in Burnwood Road in Sydenham, Durban. Last week on Tuesday night, over one hundred Malawian nationals residing in Burnwood Road had to run to the nearest police station for safety. This, after locals in the area allegedly attacked and stole the belongings of the migrants. â€œThey knocked on my door and before I could open it, it was already forced open. They asked for a cellphone and money, I told them I didn’t have any money so they took my phone,â€ Abdul (28) told the Daily Vox. Burnwood Road informal settlement, which lies adjacent Sydenham and Springfield, is a home to both locals and migrants, mostly Malawians. The mayor of eThekwini, Zandile Gumede, said the criminal attacks have left families homeless, injured and fearing for their lives. â€œThe attacks is just an act of criminality. There was an issue that happened between some of the Malawian members and locals. Instead of our South African members calling a meeting, sit down and have a discussion, a group of about 20 South Africans started the attacks,â€ she said. On Monday, reports of xenophobic attacks emerged on the media, with one woman reportedly dead after having fell from a rooftop, and others injured and hospitalised. Another man was allegedly shot dead in Greenwood Park when people were attacking foreign-owned tuck shops. Gumede insisted that the attacks on Malawians are non-xenophobic. The African Solidarity Network (ASONET), a group lobbying for the rights of immigrants and asylum seekers, said the Mayor by her utterances is just trying to protect her image. â€œIf it’s not xenophobia and criminality, how many people have been arrested? The current situation is xenophobia at its best and the best term for it is Afrophobia because it is only people of African descent who are attacked. And let it be what it is, we don’t have to play around with the words because it is what it is,â€ Daniel Dunia said. â€œWe can’t have foreign nationals who invest in their lives and then they will be beaten, their businesses looted and chased out of their communities, and then you say it’s not xenophobia. â€œThere was a great recommendation but the province has failed to implement it, and until they do, xenophobia will continue,â€ Dunia said. When the Daily Vox visited the place of safety, women, men and children were moving around the playground. The little that they could escape with, was crammed inside a steamy hot tent erected by the Municipality as shelter. On Friday, the municipality was planning to reintegrate the displaced back into the community of Burnwood settlement, a move that has been said to be of high risk by ASONET. The mayor said an agreement had been reached between the municipality and the High Commission of Malawi to take the people back into the settlement. â€œIt was also agreed during these meetings that leaders of foreign nationals should form part of community development forums in the area and the displaced foreign nationals should go back to their homes within the next 48 hours. â€œHowever, a follow up meeting will be held soon between the Municipality, the Malawian High Commission and community of Burnwood Informal Settlement to welcome back the Malawian nationals,â€ said Gumede. People were expected to return to their homes over the weekend.